(Biblical Archaeology) — An early copy of the 10 Commandments has been sold for $850,000. 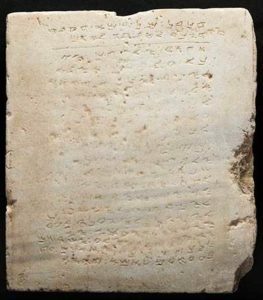 Dated by some to c. 300–500 C.E., this marble tablet may be the oldest stone copy of the 10 Commandments—even though it displays only nine of the traditional 10 Commandments from Exodus 20 and Deuteronomy 5. The 10 Commandments stone omits the command to not take the Lord’s name in vain (Exodus 20:7; Deuteronomy 5:11) and includes instead a charge to build a temple on Mt. Gerizim. Although this addition is likely unfamiliar to many Christians and Jews, it reflects the particular religious beliefs of the Samaritans. The tablet, which is written in the Samaritan script, likely adorned a Samaritan synagogue. About 115 pounds and 2 feet tall, the 10 Commandments stone entered the collection of the Living Torah Museum in Brooklyn, New York, in 2005. According to the museum’s founder, Rabbi Shaul Deutsch, the tablet was first discovered in Yavneh (near Tel Aviv in modern Israel) during the construction of the Palestine-Egypt railway in 1913.